I’ll be the first to acknowledge the fact that we have lots to do over the summer months and finding time to go fishing is, many times, not a top priority. If a little time can be freed up between working around the house and holidays, lake fishing can be extremely productive if you know how to entice the fish to strike. I always find it a little ironic that we all head to the interior in the spring and fall when the weather is generally less than favourable, and when the weather is nice and the fishing is more predictable we all seem to stay away. As trout anglers we are lead to believe that fishing interior lakes in the summer months is not very productive. This is sometimes the case, but I have had many of my best stillwater fishing days while sitting on a calm lake in the middle of summer. A couple years ago a friend and I were pleasantly surprised when we decided to fish Roche Lake in mid July. When my friends invited me to join them at the lake for a few days I felt it would be a total waste of time as we were in the midst of a hot spell, but I went anyway as I needed a break from work for a few days. Even though I knew the fishing could be hit or miss, I thought in the back of my mind, there is no better place for me to relax then sitting on a lake with a fly rod in my hand. When I arrived at the lake I noticed the water was slightly colored from an algae bloom but it wasn’t severe enough to prevent us from fishing. A few reports from around the lake said fishing had been slow but to me that just means we will have to earn the fish and I find that very rewarding anyway. In the past I have had great fishing in lakes when the water is in bloom but it usually depends on the severity of the bloom itself. The key is to use larger patterns and make sure you get the fly to the fish are they will be holding close to the bottom in the blazing sun. On the first afternoon, while putting boat in the water we quickly noticed we were experiencing the windstorm of the century. As it was going to be very difficult to cast and hold anchor we simply tucked into a small bay that had a sight break from the unrelenting wind. I started with my old faithful, a dark brown darner dragon nymph retrieved behind a type six sinking line. We put in about two hours before the wind won the battle and sent us heading for the chalet. In our short time on the water I managed to get four strikes landing three fair sized fish. My partner opted out of fishing as the wind was a little much for his liking and we still had a couple days in front of us. While back at the chalet I mentioned to Robert that it was a good sign that fish were hooked as I have had outings that the fish are zipper lipped and refuse to take anything. At least getting four strikes means the fish will bite with a little persuasion. The next morning the lake was calm as a millpond, so we headed across the lake in search of fish showing on the surface. With the upper portion of the water column being very warm, often fish will only show at first and last light in the day. As expected, very few fish were showing but we did notice a couple rises as we passed by a large bay. We anchored in approximately eight to ten feet of water where fish could still find food without being bothered by the blazing sun. We worked the area for a good two hours before my line finally tightened. The strike actually took me by surprise as I thought I had hit the bottom. When I felt the head shake of a large fish all the previous casts were soon forgotten. 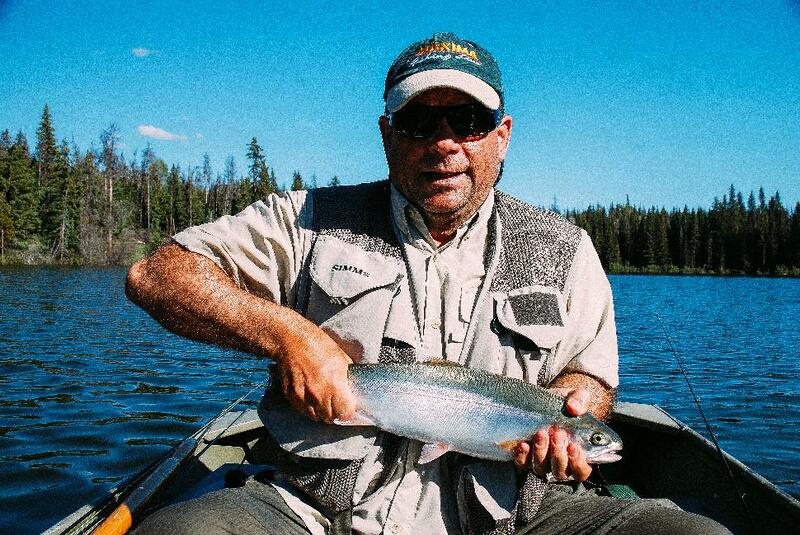 The flawless rainbow turned out to be over four pounds, which made the entire wait worthwhile. Once again the fish was taken on a dragon nymph bumped along the bottom. Over the next two days we landed over thirty nice fish with the use of leech, dragon nymph and attractor patterns. What started out looking not too promising turned out to be a rather successful summer fishing trip. On this trip we only fished alongside one other boat for a short period and other than that the lake was void of anglers. The lack of fishermen was actually quite a surprise based on the quality of fish we were landing. An important point to mention when fishing during an algae bloom is the fly should be checked after every cast. In the summer there can be curtains of slime or weed throughout the water column and you won’t hit fish if it’s wrapped up on your hook. If you asked me what I thought of fish finders a decade ago I would have said they are for people that don’t know how to read a lake. But ten years later I have a slightly different answer to the same question. I now feel the information offered by a fish finder is important and can help make us better anglers when it comes to reading a lake. The finders will show us how the transitions of the shoals protrude and where the fish like to hold on the shoals. In saying that, the key is to find a happy blend and to use the fish finder to assist you in your decisions when anchoring around a lake. I like to compare the scenario to using a calculator; they are good to use as long as you can actually add on your own too. 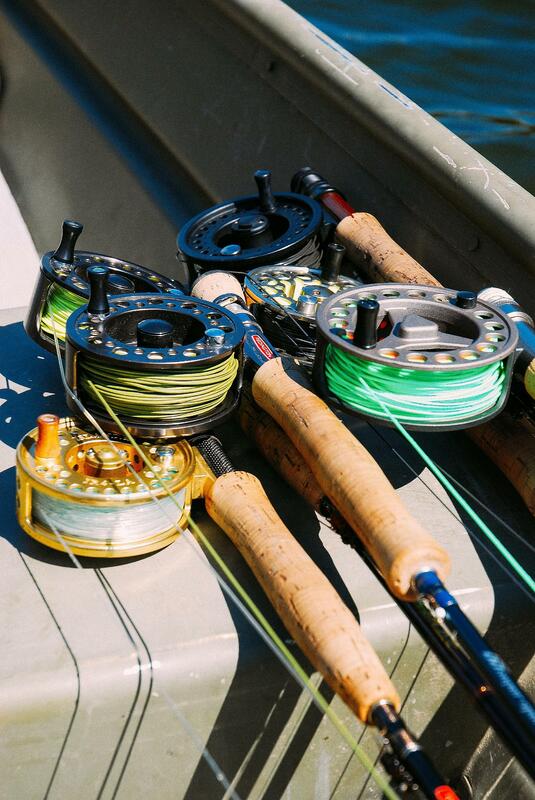 In the summer months fish can hold in depths from five to 40 feet deep, and locating them with a fly can take a great deal of time and effort that we may not have when spending a few hours on a lake. With a fish finder the fish can easily be located in the exact depth within minutes of putting your boat in the water. This can save valuable time when fishing a lake for the first time, as some lakes as not easy to figure out. One thing the fish finder is good at is telling you the depth the fish are holding in. On many occasions I have seen the fish all suspended in a band half way through the water column, in other words ten feet down in twenty feet of water. Once you know what depth they are in then you can let your line sink appropriately to cover that specific depth. With bright sunlight penetrating the surface, trout will often use structure to take cover. The most common structure in lakes is lily pads, weeds or large over-hanging branches. Work flies around these areas to the best of your ability, as this is also where insects and other forms of food will gather. In larger lakes, excellent areas to find fish in the summer months are around creek mouths and underwater springs. The water entering the lakes is often a lot cooler and aerated, which draws fish in from around the lake. When fishing around creek mouths, work the fly on either side of the current where natural food may fall to the bottom. I find sink-tip lines work well in these areas; the body of the line can be mended when it gets picked up by the current. 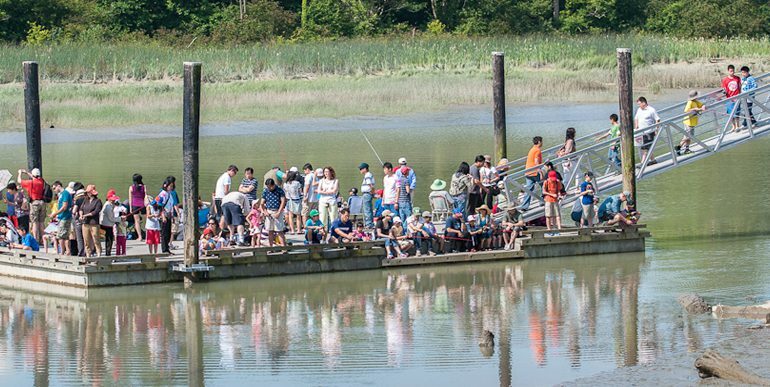 In the summer, elevation plays a big role in selecting a lake to fish. Generally speaking the higher the lake the colder the water will be, as the ice came off last and the evenings can still be cool even in the summer months. A summer technique that is starting to catch on with elite anglers is mooching a fly. This technique is exactly what the name implies. To make this form of fishing work successfully the first thing one must do is double anchor the boat in a depth that the fly can make it all the way to the bottom with the use of a sinking line. As a general rule depths from ten to twenty feet work the best. Once the anchors are down and the ropes are tight so the boat won’t swing, then lower a line with a weight on to the bottom to determine the depth. There are many ways of determining depth from a fish finder to clipping hemostats to your fly. Personally I like to clip a mooching weight to the fly and lower it to the bottom, once it is on the bottom I strip in the line unclip the weight and lay out the line. Once all this is done then simply rest the rod against the gunnel of the boat and wait for a strike. The best fly lines to use when fishing this way are type six or seven lines. These lines sink extremely fast and get your offering to the fish quickly. After a few minutes the fly line will be straight up and down and the fly will remain hanging just off the bottom where fish are hiding from the searing sun. As the boat gently moves up and down with the waves the fly will be wiggling in front of fish that are cruising along the bottom. The “take” using this technique can vary greatly from a gentle bump on the rod tip to the rod bowing over to the water in an aggressive strike. As the latter is more common, make sure your eyes are on the rod at all times. The most popular patterns to use when mooching a fly are chironomids, bloodworms and micro leeches to mention a few. In actuality any insect that lives on or near the bottom in the summer months would be a great choice. A variety of common fly patterns will produce fish during the summer months but I find the best overall success comes from insect imitations that are present in the lakes during this hot, dry time of year. When fishing a wet line along the bottom some of the most productive patterns are leeches, shrimp, dragon nymphs and damsel nymphs as they are present in the lakes year round. Whether trolled or cast, the flies must be fished close to the bottom where the fish are seeking shelter. To accomplish this, a type four or six sinking line is usually required. As trout may often hit flies out of anger even if they are not in a feeding mood, big buggy attractor patterns also work well in the summer months. Good patterns to try include woolly buggers, boobies and other patterns that just look interesting to the fish. When using these larger flies always alternate the retrieve until a successful speed has been achieved. The speed in which a fish will take a fly may even vary hour by hour, so don’t be afraid to experiment while on the water. Even though chironomids are known as a spring fly they are also productive in the summer months. On one outing to Leighton, a friend and I fished dragons and leeches for several hours with moderate success. When we cruised past a large bay we noticed a few birds swooping down to pick something off the surface. 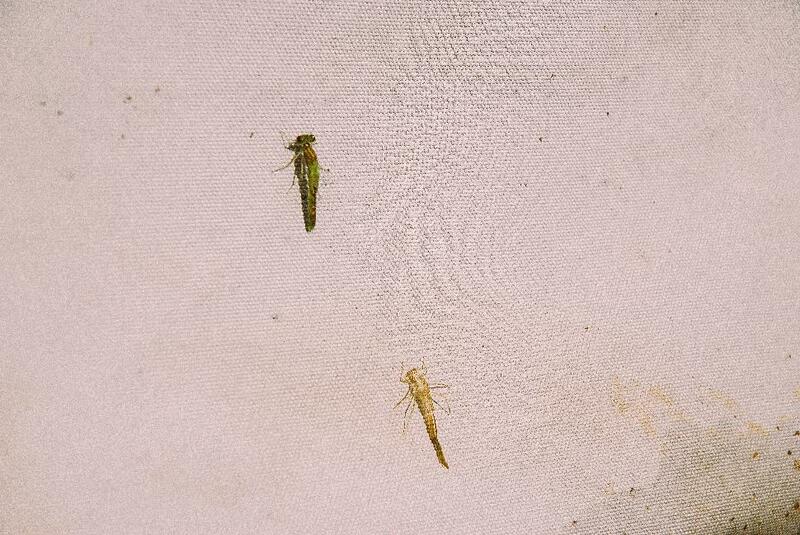 Within seconds we noticed large bomber chironomids emerging and flying away. As we only had wet lines with us we decided to try chironomids on a wet line, slowing retrieved them back to the boat. That day turned out to be nothing short of spectacular. We literally had a fish a cast until the hatch ended a couple hours after we found the fish. After that day I will not leave the shoreline without a floating line on board. Speaking of floating lines, it is not uncommon to get some surface action in the summer months as higher elevation lakes will get both sedge and mayfly hatches. While on a lake, always keep an eye open for birds swooping down and picking something off the surface. If you witness this then chances are it’s a hatch of some kind and the fish will also dial in on the food source. As for the best time of day to fish in the summer I find best overall success has happened when fishing the first two hours of light in the morning or the last hour of light in the evening. When fishing interior lakes in the midst of summer always remember the quality of fish for eating may not be equivalent to fish being kept in the spring or late fall. The flesh becomes soft and tends to taste muddy in lakes with soft and muddy bottoms. Just to play it safe, I make it a habit to not keep fish from lakes after the middle of June. In the summer I consider trout fishing a catch and release fishery which is fine to me as I do it for the love of the sport and the excitement of the battle anyway.